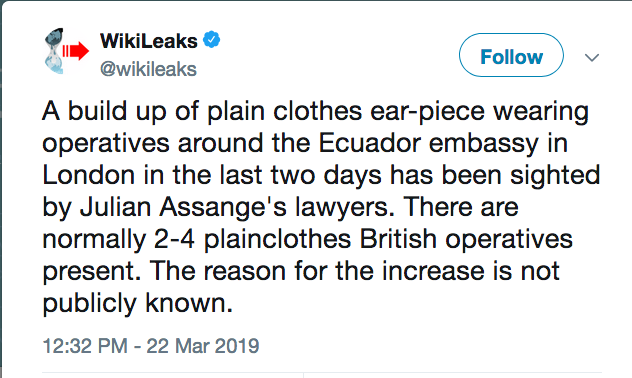 London's Met police say they were in the area of the Ecuadorian embassy earlier this evening but it was in relation to "reports of an attempted burglary and a suspect at large". cranky, the date in the timestamp is also 322 (Mar 22) - so 2x 322 combinations. Timestamp 04:29:30... 29-4 = 25, 30-29 = 1. Note also that today is 23rd = PAIN. I've been snooping on 8chan and some are saying there's a sealed indictment on him? I hope Assange is not being tortured into giving everything to the officials, and deactivating the "dead man switch" he installed. Let that sink in. 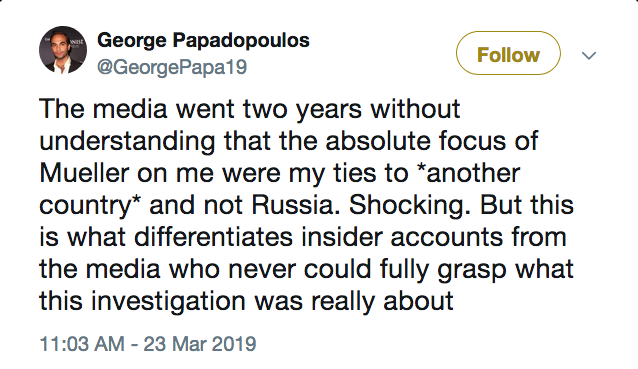 A guy who was actually involved saying RM is NOT investigating russia russia russia. Of course the dingbats could have read the RR docs or the RM press releases for content. But... teeeeeeeveeeeee.